A new report issued by Transparency Market Research (TMR) presents an analysis of the aerosol, SPF, and aerosol propellants market. The global market was valued at US$16.4 billion in 2012, and is estimatedto reach a value of US$23.2 billion, rising at 5.1% CAGR during 2013 to 2019. The research report is titled “Aerosol, SPF and Aerosol Propellants Market - Global Industry Analysis, Size, Share, Growth, Trends and Forecast, 2013 - 2019”. The research report is prepared afterextensive study of the aerosol, SPF and aerosol propellantsindustry,and presents both quantitative and qualitative analyses of the market. The report provides detailed information about the past performance, current condition, and future prospects of the market for aerosol, SPF, and aerosol propellants. The aerosol, SPF, and aerosol propellants marketstudy report includes product market analysis, application market analysis, and regional market analysis. In product market analysis, the report talks about various segments of aerosol, SPF and aerosol propellants market, on products basis.Dimethyl ether and methyl ethyl ether,chlorofluorocarbons or CFCs, nitrous oxide and carbon dioxide, and hydrocarbons such as propane, isobutane, and n-butaneare the variousproduct categories of the aerosol, SPF, and aerosol propellants market. 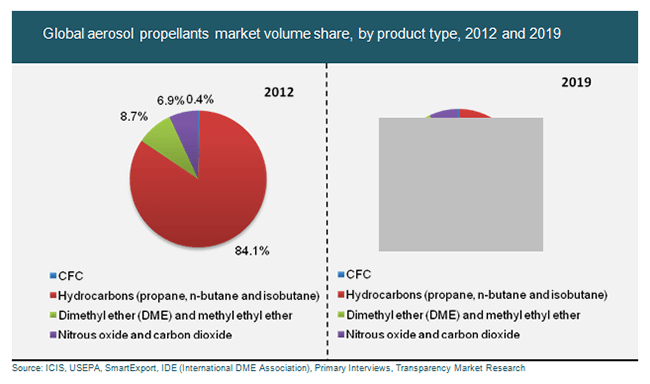 Hydrocarbons led the market for aerosol propellants,holdingover 80% of the total market sharein terms of volume in 2012.This segment is likely to grow at4.5% CAGR from2013 to 2019. Aerosol products utilize hydrocarbonsextensively. Furthermore, they are listed as ‘Generally Recognized as Safe (GRAS)’, which also helps theaerosol, SPF, and aerosol propellantsmarket grow at robust rates. Dimethyl ether contributed for a 7.7% share in total volume consumption in 2012and was considered as the second largest segment of the market for aerosol propellants. Chlorofluorocarbons held a 0.3% share in total volume consumption,the same year.They are likely to experience a decline in their overall aerosol, SPF, and aerosol propellantsmarket share in thenear future, thanks to increasing environmental regulationsrestricting their usage. In the application market analysis, the report provides insights into the various application segments of the aerosol, SPF, and aerosol propellants market such as medical, paints and coatings, households, and others. In 2012, household aerosol products heldmore than 50% of the overall market foraerosol, SPF, and aerosol propellants market. They are likely to maintain their position in the near future as well. Paints and coatings,and healthcare are opportunity-rich markets for aerosol, SPF, and aerosol propellants. These markets are estimated to grow at a 4% CAGR during 2013-2019. In the regional market analysis,the report analyzes the aerosol, SPF and aerosol propellantsmarkets of North America, Europe, Asia Pacific, and Rest of the World. Europe is the dominant market for aerosol propellants in terms of demand and is likely to maintain its leadership in coming years. The European market is estimated to bring in around 35.7% share of total volume consumption of aerosol, SPF, and aerosol propellants industry in 2019. North America accounted for a30.7% share in total volume and was second in 2012. The Chinese market presents enormous scope for aerosol products with soaring potential for growth in the Asia Pacific market for aerosol, SPF, and aerosol propellants.